Pizza delivery is getting some healthy competition thanks to Steve Harmer, the founder and CEO of Feast, a company that enables foodies to have healthy, organically sourced meals delivered straight to their doorsteps. Having grown up on a hundred-acre farm in southern Ontario, sustainable and organic food has always been an integral part of Steve’s life. After high school, Steve lived on Salt Spring Island in British Columbia, a hub for organic farming in the mid-1990s. His resumé also includes working for a health food company and at a vegetarian restaurant in Charlottetown, PEI. Prior to working at the vegetarian restaurant, Steve had no real experience with cooking. While there he learned how to create a balanced meal and menu, a skill he applies to Feast. Feast provides this balance by doing three things. The company sources its high-quality ingredients from local shops and farms. Feast’s chefs create custom menus that suit the season. The dishes are made to order and arrive fresh and hot to your doorstep. Feast is available online and as an app, and ordering is quick and simple. Creating this consumer experience is something that Steve was familiar with, as he has a background in technology and marketing. Moving into the restaurant and food services industry, however, was a learning experience. Feast is evidently a company looking to create positive change in the food industry. Some have asked Steve how he balances the capitalist requirement to make money and the moral aspect of inciting this positive change. To that he answers that the two are not mutually exclusive. “It’s trying to find the sweet spot between creating a self-sustaining business that can grow, contribute jobs and bring cash back to the investors and developing a customer base that appreciates the transparency of the workplace environment and is willing to pay some kind of premium to preserve the integrity of the business,” he explains. Launched in July 2015, Feast currently only offers its services to Torontonians. Five years from now, Steve hopes to expand the company’s services to hungry stomachs in a half-dozen cities. The company is also putting together a team that can continue to look into how technology can improve inefficiencies in various areas of the food industry. For now, FEAST is considered a business-to-consumer company (a company that sells directly to consumers through the Internet), but Steve says it could transform into a business-to-business company (where a company makes a commercial transaction with another company). “We could supply smart vending machines and look into ways to service outlying communities such as Oakville, Mississauga and Markham, which are not as dense as Toronto,” he explains. With all of these prospects also come possible risks, but Steve isn’t afraid of tasting failure. He thinks it’s important to fail, especially when there might be a lot of risk. Right now, the company is trying to figure out how to infiltrate the dinner market. 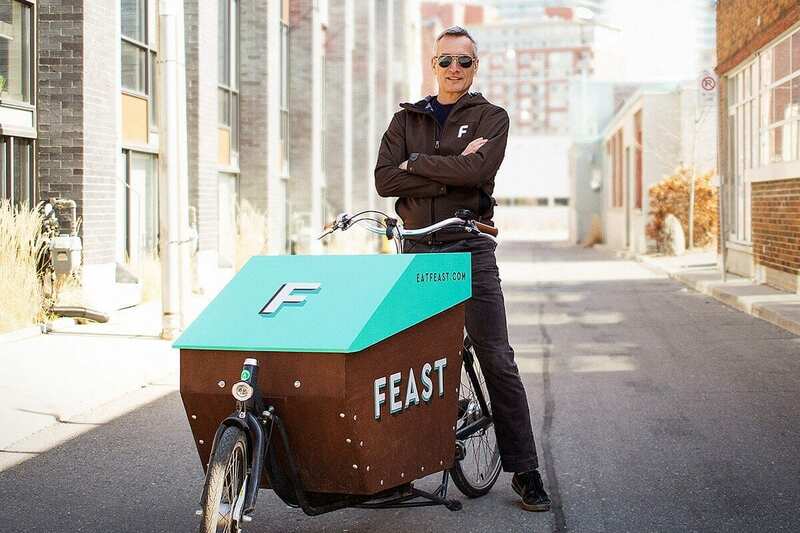 In early May, Feast expanded its dinner service to Rosedale, Summerhill and Rathnelly. Prior to that it launched a one-week trial in Rosedale, providing people with free meals in exchange for completing a survey online or by phone. Steve says it was about a two-week investment and that if it had failed they would at least have learned from it. Thankfully, the trial didn’t fail and the Feast team is on to its next project: an employee meal subsidy program.